When government officials become the servants of the companies they regulate rather than the masters, they are “captured.” Political economists who describe this process point out that when regulators are captured, much of what they do is motivated, consciously or not, by a desire to help the industry they are regulating, even when the social goals they should pursue are very different. A famous illustration of capture is the way airlines were regulated under the Civil Aeronautics Board (CAB) from 1940 to 1978. Large airlines of the time, such as American and Delta, naturally had a strong incentive to try to keep new airlines out of the industry. As a compliant ally of the airline industry, the CAB did not approve one new interstate airline during this almost forty-year period. Only after President Carter abolished the CAB did many new airlines enter the industry; some of the old standbys, such as Pan Am and Eastern, ceased operations because they could not adjust to a competitive environment. 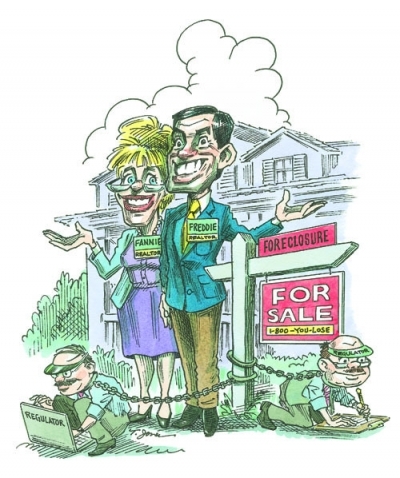 An economically disastrous example of the capture theory is the disgraceful regulation of the two mortgage behemoths, Fannie Mae and Freddie Mac, before and leading up to the recent financial crisis. In their fascinating recent book, Reckless Endangerment, Gretchen Morgenson and Joshua Rosner explore in great detail how Fannie Mae used political connections and intimidation of anyone who stood in its way to gain a highly dominant position in the residential mortgage market. The authors show that various government officials, including Congress members and presidential cabinet members, closed their eyes to what these two government-supported enterprises were doing. They allowed them to take on enormous risks while publicly defending their behavior as not highly risky. Fannie Mae was created in 1938 as a government enterprise that purchased mortgages from banks that loaned money to homebuyers. It eventually became a private investment company regulated by the government, one whose investors expected the government to help out if these companies got into trouble. By the beginning of the crisis in 2008, Fannie and Freddie held or guaranteed about half of the United States’ $12 trillion of assets in the residential mortgage market. In September 2008, both Fannie and Freddie were taken over by the federal government when they became insolvent. The loss to taxpayers is likely to be in the hundreds of billions of dollars because many of the mortgages are subprime and of little value. Fannie Mae and Freddie Mac had so much money and political power that it was risky to oppose what they wanted. Reckless Endangerment shows how the chief executive officers of Fannie Mae reduced the regulatory control over their company by assiduously courting congressmen, Fed officials, the Congressional Budget Office, high-level officials of the U.S. Treasury, the secretary of Housing and Urban Development, and major economists. The prominent and well-informed congressman Barney Frank earns especially sharp criticism for his continual support of Fannie and Freddie while he was initially a member, and later chairman, of the House Financial Services Committee, the powerful panel charged with oversight of the housing and financial sectors. Frank remained an unwavering supporter of Fannie and Freddie until 2010, when he admitted that they should have been more closely regulated. In a bit of irony, he is a principal author of the 2010 Dodd-Frank Act that attempts to reform the financial sector, mainly by giving even greater discretion to the regulators. Fannie and Freddie had so much money and political power at their disposal that it became risky for anyone to oppose what they wanted: large increases in their holdings of subprime and other mortgages, with no questions asked. Different government agencies that were supposed to either regulate or oversee them ended up as advocates instead. Well-known economists wrote favorable articles downplaying the riskiness of their holdings. These articles sometimes appeared in publications sponsored by these companies. A few government officials were brave enough to risk the wrath of Fannie and Freddie. The authors give particular praise to June O’Neill (I am proud to say she is a former student of mine), who was then head of the Congressional Budget Office. A member of her staff wrote a report that was critical of the degree of risk to taxpayers from the assets held by Fannie and Freddie. These companies tried to get June to suppress the report—she refused—and then a few members of the House of Representatives, in cahoots with Fannie and Freddie, subjected her to vicious attacks when she steadfastly defended the report in testimony before Congress. The Fannie and Freddie story doesn’t demonstrate that government officials, members of Congress, economists, and others who sang their praises were corrupt, although undoubtedly some were. The Fed also comes in for sharp criticism. One example discussed was a Boston Fed publication in October 1992 claiming that minorities were widely discriminated against in gaining access to mortgage credit. The media, many regulators, and some economists widely praised this study as offering definitive evidence of extensive discrimination against minorities in the credit market. Fannie Mae’s head, the politically astute James A. Johnson, seized on this reaction to promote a large increase in mortgages to poor residents of African-American and Hispanic communities with bad credit histories. Since I had written a book on discrimination against minorities in the economy, I was curious to see how the study reached such definite conclusions about mortgage discrimination. I became convinced after reading it that it was deeply flawed, failing to show the discrimination it alleged. The theory of discrimination against minorities implies that minority applicants for mortgages would need to have better credit records and higher employment stability than comparable whites in order to obtain mortgages. This suggests that default rates would be lower and profitability higher on loans to minorities. The study’s authors presented no evidence to support their implications. All the circumstantial evidence, and some more concrete evidence, showed just the opposite. I published my criticisms in a column for BusinessWeek in 1993. The Boston Fed and its supporters tried defending their study against my attack and those of others, but their arguments were weak. Nevertheless, the view persisted that the Fed had “proved” widespread discrimination in the credit market against minorities. And this belief helped justify an expansion of mortgage loans to families with low incomes and poor employment records. I am not claiming that the reckless behavior of Fannie Mae and Freddie Mac was solely, or even mainly, responsible for the financial crisis. Enormous blame must go to the commercial and investment bankers who took on vastly excessive risks that endangered their companies and the economy. Nevertheless, officials charged with overseeing Fannie and Freddie protected the interests of the companies instead of the interests of taxpayers and the general public. This capture of regulators inflicted great harm on taxpayers, the American and world economies, and many of the families who exposed their life savings to undue risks in the mortgage market. Reprinted from the Becker-Posner Blog (www.becker-posner-blog.com).